CONTROTEK Swing Check Valves are provided with properly guided and balanced Swing Disc through a hinge. The hinge and swivel disc are inter-connected maintaining balanced flexibility for smooth and efficient sealing. CONTROTEK Swing Check Valves are available with metal to metal sealing for high temperature & pressure, soft sealing for pneumatic and vacuum applications. 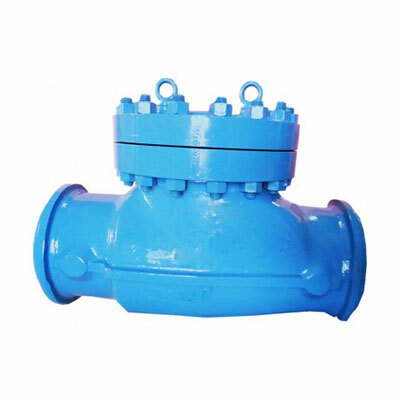 Perfect design ensures smooth and trouble free performance of the Valve. CONTROTEK Non Return Valves open and shut with a very nominal differential pressure from either side. The flow profile is meticulously designed to ensure minimum pressure drop across the Valve. MOC Iron, Carbon & Carbon Alloy Steel: Nodular Iron, Carbon Steel, Low Temperature Steel, High Temperature Carbon- Alloy Steel etc.